During the time that I was away, haven't visited any nice places nor search for any nice food... *sobs* What I did was taking up Feng Shui lesson, it's been 2 months now... Oh well, guess I'm back for good!! In the mixer bowl, start of with egg whites and vinegar, make sure bowl is CLEAN greaseless. Beat the whip attachment on medium low speed until it foams up till the meringue holds soft peak. Start adding sugar a tablespoon at a time and continue to beat medium-high speed until the meringue holds very stiff peak. Test whether sugar has dissolved by rubbing between your fingers. It should not feels gritty of sugar. Gently spread the meringue inside the circle drawn on the parchment paper (baking paper, grease proof paper, or silicon paper) smoothing the edges. It doesn't have to be perfectly neat, but at least a nice flat top or with higher sides (you might want a slight well center to place whipped cream and fruits). Put the meringue into the oven and drop the temperature to 120 celcius and bake for 1 hour 15 minutes or until outside is dry and takes on very pale cream color. Turn oven off and leave it to cool completely in the oven (about an hour or so). The cooled meringue can be made and stored in cool dry place or airtight container for a few days. huh? no... I don't remember seeing ur mum's pavlova. which entry was it? 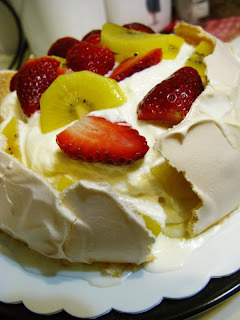 Oooh, I made a pavlova a few weeks ago for an Australian dinner party I hosted. Yours looks beautiful and elegant! Oh WOW! I would love to see yours! Since it's made for a party, you made a big Pavlova aye? yummy! i luv ur blog. keep updating! would like to see a lot more from the blog. and nice photos u took. btw, wat camera u're using? Awww... Thx for the compliment! Hmm, I posted it on my blog a few months ago. Damn I can't find that post, LOL. Anyway, Pavlova is one fucked up addicted desert. Oh, it's a New Zealand dish, by the way. Haha. Next year I'm gonna have loads of it.... @@ Sugar high!